Well, he certainly has it right. While colour has a vibe of its own, there really is something charming about black and white bridal photos. They have a way of stopping time itself - when you look at a bnw frame, it’s as if that very moment is frozen in time. You may say that every picture manages to save a moment - and that’s true! But black and white images manage to capture the very emotion in it, don’t you think? Don’t get me wrong, I do love colour. But you can’t deny that there is so much more essence in black and white! What’s more is that when you’re going through an album, especially an Indian wedding album, those few black and white shots do provide a refreshing change from all the bright colours. While black and white photos used to be a thing of the past, this 'filter' is super popular now (for obvious reasons stated above) and every wedding photographer gets a couple of bnw shots into the album! But if you'd like more than just a few, go ahead and tell your photographer, who we're sure will happily oblige. 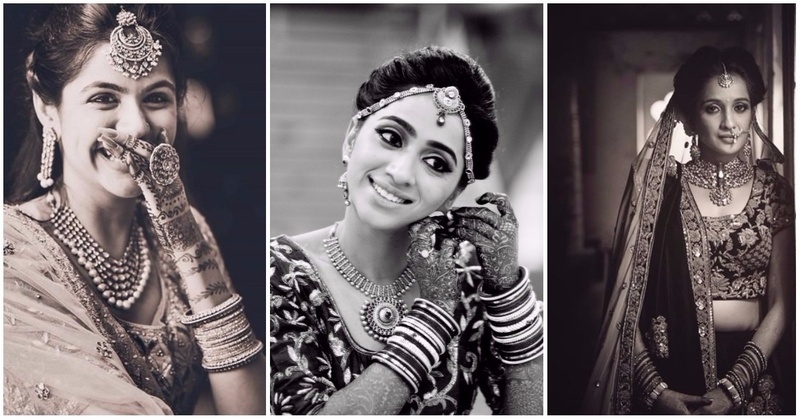 We saved a bunch of some of the most beautiful black and white Indian bridal pictures we came across. Have a look and tell us if we’re wrong!